You know the saying…”you learn something new every day?” Well today I learned that making your own bath and body powder could not be easier or faster! 3 ingredients…less than 5 minutes…and you have your own customized powder for personal use or gift-giving! I decided to make mine “unscented”…but you can certainly use your favorite essential oil in this recipe. Lavender, of course, would be divine! As would rosemary, jasmine, geranium, etc. You could also add a few drops of your favorite perfume to turn it into a fragrant dusting powder! The baking soda and cinnamon are natural deodorizers while the cornstarch is very absorbent. Just mix the 3 ingredients together in a bowl and transfer to the container of your choice. I fashioned a paper funnel out of a piece of printer paper to make the transfer a little easier. My container was a mason jar (big surprise there!) with a couple of holes punched in the lid. 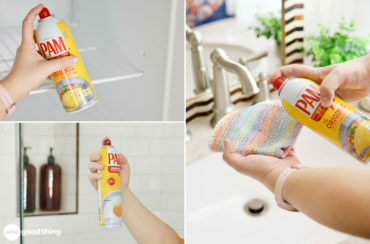 You could also repurpose an old baby powder container or even a parmesan cheese shaker. Store the extra in another container to refill as needed. If you live in a humid climate, add about ¼ cup of uncooked rice to the powder to keep it from clumping. The rice won’t shake out but will keep the powder flowing smoothly. As you can see, this made a nice, big batch of powder! You could cut the recipe in half if you didn’t want to make that much…or you could double it for making gifts! Question: do you mix the essential oil in with the dry ingredients?…Or does that make it clump up? I’m excited to try this, but I’m not sure at what point the essential oil is added. Thank you! I love the idea of this powder. I would put it in something different. Do ya’ll remember the candy dishes at grandma’s house well they still sell them at stores like Fred’s and Rose’s. You can get powder puffs at Walmart. It will look pretty in the bathroom. Just a idea. So is this powder also used as a underarm deodorant? I’m prone to rashes under my breasts and other creases on the body and my doctor told me not to use cornstarch products because they feed the yeast. I’m wondering if this recipe will still work if I omit the cornstarch? what an awesome idea, Jillee. In fact, all your ideas are awesome. During the summer months, when the humidity is purgatorial, (a real sinner’s sneak preview!) I like to powder my bedsheets with talc. But like others, the safety issue was a real downer. I’ll use this recipe, along with the omnipresent Mason jar, to concoct a delectable, cooling powder to sprinkle on the bedsheets. Maybe I’ll add a dash or two of lavender oil, or rose absolut, or maybe jasmine. The possibilities are endless. BTW, can’t wait for your book to come out. Yeah I can’t wait to make this either. I just read about talcum powder being really bad, possibly causing cancer. I have tried just plain corn starch but I didn’t like it. Hi, Can’t wait to try this recipe. Ca you tell me if baking soda is the same as bi-carb soda please? Leonie. Yup! They are the same thing.